Sold by Austin Bazaar and Fulfilled by Amazon. Gift-wrap available. I buy the things I review, I never trade positive reviews for free stuff. 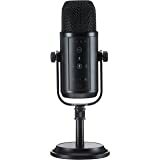 This is an amazing microphone for an equally amazing price. 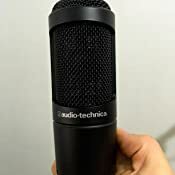 I've been a fan of Audio Technica microphones since the mid 1970's. Their products are not following fads, they are innovative and quality for reasonable prices. 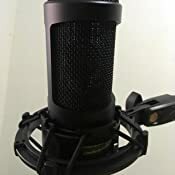 In my studio I have many microphones that sell for over $1200, I've owned several U-87 and I've built some of my own large diaphragm microphones so I'm familiar with the beasts with over 50 years of recording and pro sound experience under my belt. This Audio Technica model has the largest diaphragm of the whole AT line regardless of price. Diaphragm size wise you can't really compare it to the top two most expensive AT models since those use completely different diaphragm construction. 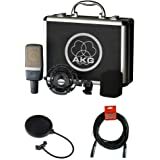 Of the microphones that AT offers with traditional LDC construction this one has the largest of them all yet it's one of their lowest price models. 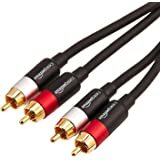 I have an AT 4047 which cost about four times as much as this AT2035 and while the more expensive model does have a slightly different sound I can't say it's really better. I've recorded the same vocal using both and often I prefer the AT2035 because it has a bit smoother response, a little less bright above 5K. The AT2035 is really a very balanced and excellent sounding microphone, I will probably buy another one so I have a stereo pair. Interested in how the size of the diaphragms stack up? So there you go, the AT2035 wins the size competition and it's an excellent sounding microphone for a seriously bargain price. 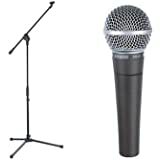 This microphone compares very favorably with my vintage AKG 414B-ULS microphones, very smooth frequency response. The shock mount that comes with the AT2035 is very tight, makes it a little difficult to get the mic in and out, this mic slips right into the shock mount that came with my AT4047 so it's easy to switch back and forth between the two for different vocal tracks. 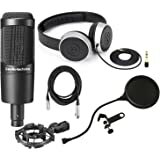 As a side note, the AT2020 is another incredible deal, it's very low priced compared to other professional microphones but it does not disappoint in sound quality. I have several of those which I use for mic'ing up my 4x12 Marshall cabinets, l love the clear and even sound these microphones have. 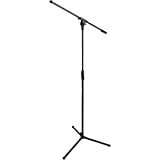 I own several MXL LDC microphones which always need work to sound great, I've replaced the diaphragms in five MXL 2001 and use these on drum toms. I wish I'd known how good these low priced AT microphones sounded before going down that path, the AT2035 makes an excellent tom tom microphone too and it's all done, you don't need to spend an afternoon disassembling mic's and soldering fragile expensive components. The diaphragms I installed in my MXL mic's cost as much as a done AT2035, save yourself the work and get the AT. 5.0 out of 5 starsStomps any USB mic. 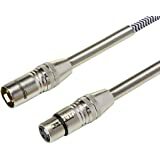 Great starter XLR mic! Audio quality is stellar. 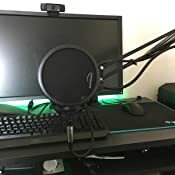 Went from a Blue Yeti to this and I'll never go back. Mic is light and professional looking. No directional recording switches, but all I do is cardioid so nothing is lost there. Works fine with Focusrite Scarlet Solo. 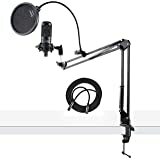 All you need is this mic , a mic stand or boom (or both) a Audio Interface and a good computer to Rock and roll with this mic. 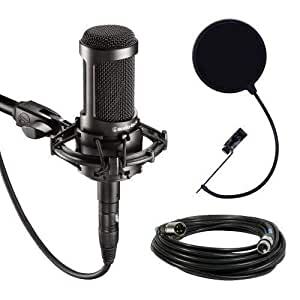 Buying a microphone I'd never used previously, based primarily on reviews, seemed like a hit-or-miss proposition... but I took a chance... and think this may seriously be the best one I've ever owned. Hooked up to a DBX 286A for phantom power, preamp, and just a touch of compression, the result was pure audio bliss. I was able to work it up close, and get the vocal warmth and proximity effect I wanted with essentially no effort. It's got a crisp, full, responsive sound... as, of course, a condenser sould be able to deliver. This one gets the job done, beautifully. It's nice looking, too, with a classy matte finish, and a cool shock mount with what looks like a mesh of tightly-stretched tiny little bungee cords. 5.0 out of 5 starsPro quality for a great price! Been using this microphone for almost a year now and I love the thing. 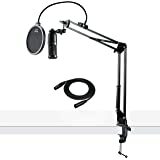 It's great for recording voice overs, or vocals for music. I use it to record guitar too! Haven't had any issues with it. I added a little sample showing off what it sounds like. I'm blown away by this mic. I do voiceover work, commercials and more. I've worked in radio for 10 years and never had a mic this nice. It's clear and warm with awesome depth. For what I'm doing, it's perfection. 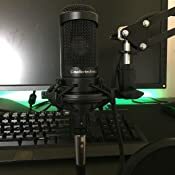 For the longest time I've use a blue yeti usb mic to do commentary tracks for videos and streams. It sounded pretty good. 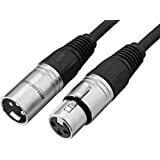 One day I decided to try something a little different and I heard that XLR mic do provide better quality for the work I tend to do, so I gave it a shot. I of course paired this with the focusrite which acted as the interface between the mic and my computer and attached the mic to the mic stand that I already had. I was actually surprised that I sounded way better than I thought I would when I tested everything. 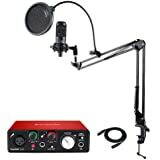 I thought I would sound the same as I did on the yeti since they were both around the same price range but the AT2035 is clearly the better microphone, although it does require the interfacing device if you want to use it with a computer. Wow is this microphone amazing! It feels like a great mic, it looks great, and it sounds amazing. There's really no downside to this thing. I guess my chief complaint would be that it's SO sensitive that literally anything you can hear with your ear (distance sounds, neighbors, ambient sounds) can all be heard through the mic as well. You may need some type of software to filter out background noise unless you're in a soundproof studio! Hehe. Definitely best bang for your buck.